WhatsApp is fastening things to curb spam and misinformation on the platform. As we reported earlier, WhatsApp has now rolled the Suspicious Link Detection feature for Android Beta users. The new feature has been rolled out to the users with the latest beta version 2.18.221. The feature has been rolled out globally for all the beta users on Android. 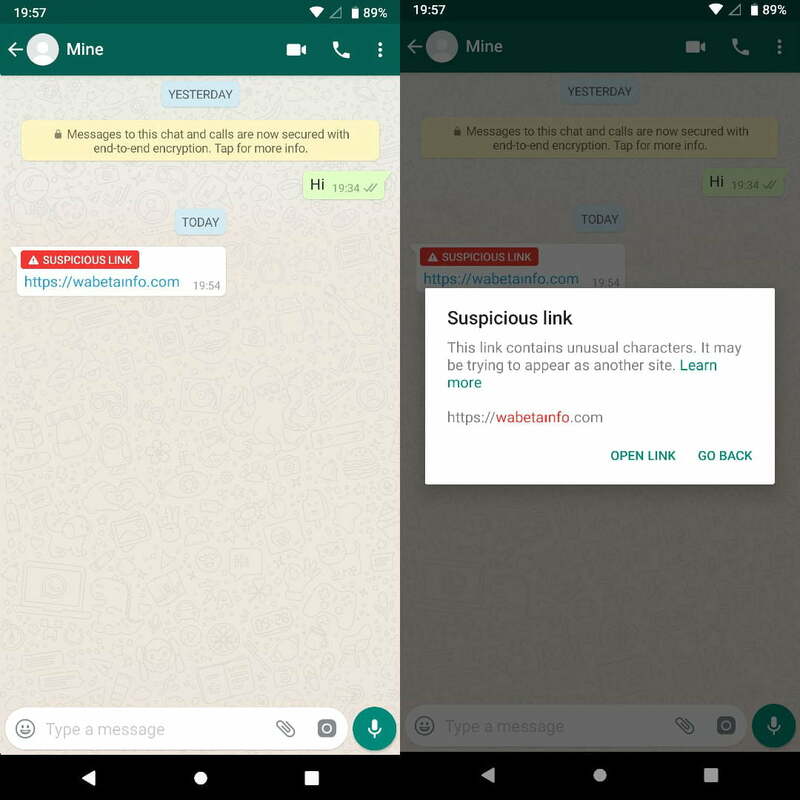 Basically, this feature scans incoming messages which contain links and if WhatsApp thinks it as suspicious, it will highlight the message with a red label with ‘suspicious’ text. As you can see in the image, that’s how WhatsApp highlights a message with a suspicious link. And if you try to open the link, it will show a warning stating that you’re trying to open a harmful link and will give two options whether to proceed or go back. We have tested this feature and is working properly, but it’s yet to be seen whether WhatsApp is able to scan the links properly or not. Having said that, WhatsApp seems to just scan the link and if it consists of an unknown character, it will term the link as suspicious. This feature rollout was first spotted by WhatsApp watcher WABetaInfo stating that it’s available only for Android Beta users at the moment and not for iOS or Windows Phone users. WABetaInfo also noted that WhatsApp scans the link locally and it doesn’t have anything to deal with Facebook/WhatsApp servers. So if the link has an unusual character, WhatsApp will mark it as suspicious. “WhatsApp detects the link as suspicious locally: it means no data are read from WhatsApp/Facebook servers in order to verify if the link is suspicious,” said WABetaInfo in a blog post. This is the yet another major step taken by WhatsApp to reduce the spreading of spam on the platform. It’s unknown when the feature will be rolled out to iOS and Windows Phone users.